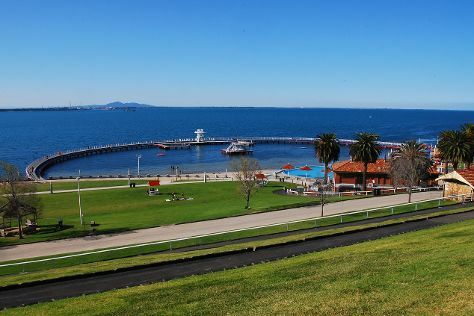 Geelong is a port city located on Corio Bay and the Barwon River, in the state of Victoria, Australia, 75km south-west of the state capital, Melbourne. It is the second largest Victorian city, with an estimated urban population of 191,440 as at June 2016, having grown 2.1 percent since June 2015.Geelong runs from the plains of Lara in the north to the rolling hills of Waurn Ponds to the south, with Corio Bay to the east and hills to the west. Geelong is the administrative centre for the City of Greater Geelong municipality, which covers urban, rural and coastal areas surrounding the city, including the Bellarine Peninsula.Geelong City is also known as the 'Gateway City' due to its central location to surrounding Victorian regional centres like Ballarat in the north west, Torquay, Great Ocean Road and Warrnambool in the southwest, Hamilton, Colac and Winchelsea to the west, and the state capital of Melbourne in the north east. Geelong is in City of Greater Geelong. Plan your trip to Geelong and other Australia destinations using our handy Australia online tour builder .